On February 21 and 22, 1975, an International Workshop on the "Genetics of Diabetes Mellitus" was held in Goettingen, West-Germany. This workshop had been organized hy the Department of Medicine, University of Goettingen, and was generously sponsored by the Deutsche Forschungsgemeinschaft. Some forty geneticists and clinicians from Europe and N orth America, working in the field of diabetes both in man and laboratory animals, participated. The 25lectures presented at the workshop are now assembled for publication. Some of the animated discussion which followed the presentations has been included in the final papers by the speakers. Some lectures summarize the recent literature, others present data from recent research. Thus, a comprehensive and modem review of the theoretical and practical problems of diabetes are offered by this volume. related to the genetics The confusion about the mode of inheritance of diabetes mellitus during the last two decades can only be resolved by joint discussions between geneticists interested in diabetes and clinical diabetologists interested in genetics. Knowledge of modem genetics and of the heterogeneity of diabetes mellitus are necessary in order to disentangle the complex scene. 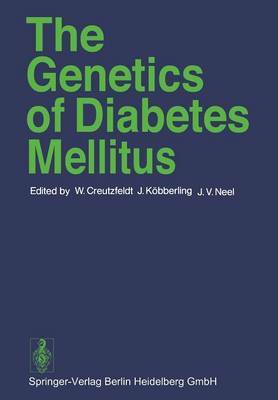 Optimistically, the publication of this work on the genetics of diabetes will help to achieve this aim and to establish the concept of genetic heterogeneity of diabetes mellitus. The editors are grateful to Springer-Verlag, Heidelberg, for the prompt publication of these proceedings and to the Farbwerke Hoechst AG, Frankfurt (M), for their contribution to the printing costs.